Recently I’ve been working on a couple of weddings with a yellow wedding color theme. Yellow is such a bright vibrant color, which looks wonderful for a spring or summer wedding. The great thing about a yellow wedding color theme is there are plenty of flowers, wedding invitations, favors and decorations available to fit with this wedding color. 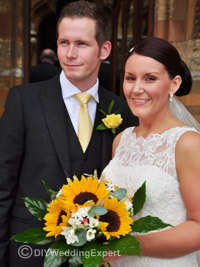 Sunflowers are a striking wedding flower for a yellow wedding color theme and you can see in the photo here how I’ve used them in a hand tied posy bouquet. The bride loved sunflowers and was keen from the start to use them throughout her wedding decorations including the centerpieces. Discover more ideas for all your wedding decorations for a yellow wedding theme. I’ve just made a new tutorial on wedding table card holders that you might want to have a look at. I’m permanently working at different weddings setting up the wedding centrepieces on the morning of the wedding. One thing that I’ve noticed is people have great ideas for themed table names, they’ve gone to the trouble of making decorative cards with beautiful embellishments but they have no stand or are displayed badly. A lot of people rely on using the hotel or venues table card holders and believe me they can vary from being quite good to pretty unusable. I’ve seen table name cards that are so large and high they block the view across the table, ones that fall over as soon as anyone enters the room let alone sits at the table through to no holders at all so they are just left lying flat on the table. So don’t let this happen to you, as you think up your table names don’t forget to think about your table card holders as well. 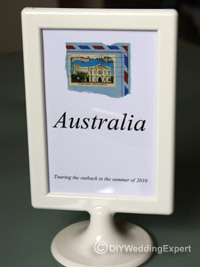 In my table name holders project I’ve taken the theme of travel and used an Ikea photo frame, which I think are great for a wedding table. They are the right size i.e. big enough to see and identify but not too large to overpower the table. Most importantly they are a good height, as they are not going to get in the way of the view across the table. Finally they are also very inexpensive to buy costing just over a £1 each. Give your wedding tables a finished and professional appearance by creating your own stylish wedding table card holders. 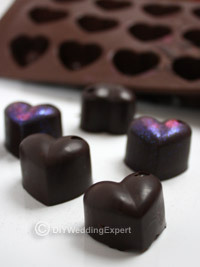 Check out my new DIY wedding favors chocolates tutorial showing you how to create your own delicious favors. You won’t believe how easy and quick these delightful homemade chocolate wedding favors are to make. By adding your own color coordinated edible glitter or unique flavours you will create professional looking wedding favors. You can make these favors well in advance of the wedding and store them in the refrigerator. People always love it when they receive gifts that have been hand crafted and these homemade chocolate wedding favors will be no exception. Just remember don’t eat too many before the wedding or you won’t be able to get in your dress! Don’t panic you haven’t got to be a chef or even a good baker to create your own stylish wedding cake. Why not buy your own wedding cake from a local supermarket? Now a few years ago you might have thrown your arms up in horror, but these days a lot of the big stores are creating great wedding cakes. Here you can see me holding a couple of tiers of fruitcake in my local Marks and Spencer store. They have a great range of cakes in all sorts of sizes, flavors and styles. Let’s face it not everyone is a fan of fruitcake, so if you want chocolate sponge then go for it. You can literally make your own cake with the flavours you choose in the size and number of tiers that suits you. 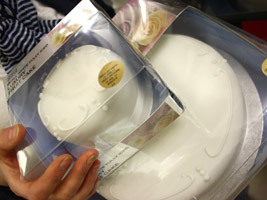 They also sell all of the bits you need to construct your cake including plastic support dowels and pillars. Over the years I have decorated many of these cakes and people are always telling me how delicious they are. 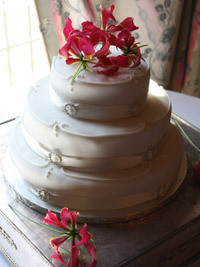 I’m often asked to add wedding cake flowers to the top of these tiered cakes. The flowers are always made to coordinate with the bridal bouquets, wedding centerpieces and overall wedding flower theme. This makes the wedding cake unique, no one will guess it’s a shop bought cake once these touches have been added. You can also decorate them with bands of color coordinated satin ribbon. You might want to think about adding details like these elegant diamante brooches that you can see in the photo here. You can see how I simply placed the beautiful gloriosa flowers onto the top and side of the cake to give it a totally unique and sophisticated look. If you want to create a rose or mixed flower wedding cake decoration then simply follow my step-by-step tutorial. These days it couldn’t be easier to create your own stylish wedding cake and by adding simple yet personal wedding cake decorations it will be special for your big day. Are you looking for ideas for blue wedding centerpieces? Well here is one of my new designs, a blue hydrangea centerpiece that is really simple to create. 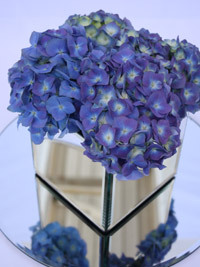 In the photo here you can see how I have packed the blue hydrangea flowers into a mirrored cube vase to make this stunning low wedding centerpiece. This sort of arrangement looks very stylish and has lots of impact on wedding reception tables. Other blue flowers that are suitable for blue wedding centerpieces include delphiniums, hyacinths, agapanthus and erygium thistle. If you are having a blue wedding theme but would prefer not to use blue flowers then think about adding blue accessories such as feathers, butterflies and stones. If you would like to create this blue wedding centerpiece then simply follow my step-by-step instructions to create this DIY hydrangea wedding centerpiece. I just love using velvet ribbons when I’m creating boutonnieres and bridal bouquets. You can see in the photo here (left) how I have used a deep red velvet ribbon to finish off this boutonniere or buttonhole. I think velvet ribbons fit so well with the recent trend for vintage themed wedding flowers. 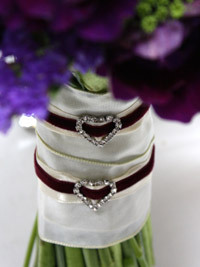 I love adding velvet to the bouquet handle of bride’s and bridesmaid’s wedding posy bouquets. I often thread thin velvet ribbon through diamante brooches (see one I recently did, photo below left) or pearl buttons to make unique bouquet detailing that’s really special for the bride. 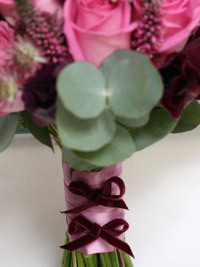 I always choose coordinating coloured ribbon that matches the colour of the flowers in the handtied posy bouquet. 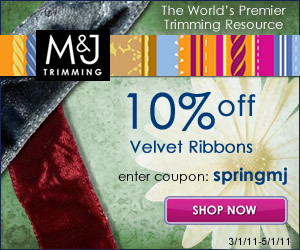 I’ve just received this great offer for 10% off all velvet ribbons from M J Trimmings. They have a wide selection of velvet ribbons in lots of colors and widths. I’m sure you’ll be able to find a ribbon to fit with your wedding color theme. 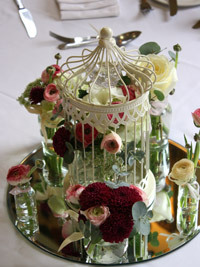 I’ve just put up a new tutorial on how to create a vintage birdcage centerpiece, which I just love. I’ve arranged small posies of old fashioned wedding flowers including ranunculus, hydrangeas and roses in jam jars around a central birdcage. This was inspired by a wedding I worked on. The bride asked us to decorate her tables with posies of coordinating wedding flowers in vintage vases and jam jars. She really enjoyed collecting the vases from junk shops and charity stores and I loved creating unique posies for each of the containers. Birdcages have become such a popular wedding table decoration that I really wanted to create a unique DIY birdcage centrepiece which combined these vintage style posy decorations. The birdcage I chose to use were not too big which left me plenty of room to place the posies of flowers around it. I hope you enjoy creating your own unique DIY vintage birdcage centrepieces as much as I did. Don’t forget to keep visiting my wedding craft tutorial page as I’m always adding new DIY wedding ideas. I love homemade gifts at any occasion as it gives such a personal touch, knowing that someone has lovingly created them for you. So why not take the same approach to your wedding favors. 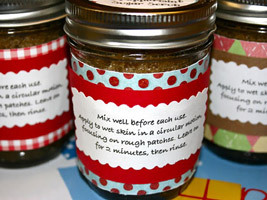 I recently found a tutorial on smartbottomenterprises for a homemade sugar scrub and I though it would make a prefect homemade wedding favor for the ladies at the wedding or bridal shower party. Lets face it we all love an excuse for a pamper. If you don’t think you have the skills to make your own jar labels then why not get them professionally printed. Then you can add your names, wedding date and choose a motif and color to fit your wedding theme. Check out this personalised label printing site. The great thing about these homemade wedding favors is they can be made well in advance of the wedding. You could even invite your girlfriends round to get a little production line going. I would suggest using a smaller jar than those in the tutorial just to keep the cost of materials down. But don’t forget to add that delightful little spoon I just love that special touch. I’ve just found this great offer for you for wedding stationery from Minted. This spring wedding event gives you a 15% discount off their entire wedding collection. The only problem you now have is choosing your favourite Minted wedding stationery, as they have so many fabulous wedding invitations, save the date and thank you cards. One of my favourite Minted products is their personalised save the date cards. The reason I like these is simple you can add your own unique design to them. So if you are not a confident DIY person these save the date cards might prove to be perfect for you. You can add your own unique and special photo to them and let Minted produce them for you. By adding your own unique photo to these cards you can create a really special and unique design with the photo image that you take. You don’t have to use a photo of the two of you, how about going for a more abstract approach. Why not take a photo of you and your fiancés favourite shoes lined up in a quirky manner! If you have a seasonal wedding theme you could take a seasonal photo for instance, trees in the fall, a collection of coloured Christmas baubles, spring bulbs in the field, the possibilities are endless. If your wedding has a theme then you could use a photo in keeping with that. Are you having a beach wedding theme? You could use your favourite holiday snap of the pair of you on the beach! I hope that gives you a few ideas to get started and make use of this great money saving over. Happy Shopping. If you are planning a Vintage Wedding Theme you might like these lace wedding favor decorations. We are using a lot of lace this year in bridal bouquets to compliment the bride’s lace wedding dress. This includes lace detailing on the bouquet handles and curls of lace in-between the bouquet flowers. You could take this lace theme through to your wedding centrepieces, invitations and wedding flowers. So why not think about adding this detailing to your wedding favors. 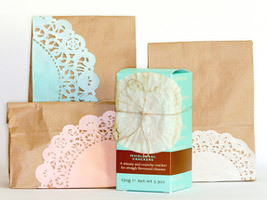 I’ve just found this Lace Motif Favor Bag Kit at laborofloveprojects, which you might want to check out. If you are planning on having a vintage wedding theme or like the idea of using lace in your wedding decorations then you might like this idea.